Successfully Added Smart Robot Vacuum Cleaner with Virtual Wall + Charging Station to your Shopping Cart. Robot vacuum cleaner for making life easy. This intelligent robot vacuum cleaner comes with a charging station, remote controller, easy-clean dust air filter, and is designed with different mode options for timing and scheduling your cleaning cycles. This robot vacuum cleaner effectively picks up dirt, debris, pet hair and dust from carpets, wooden floors, marble floors and nylon flooring. The robot vacuum cleaner first sweeps up your floor with the installed counter rotating bristle brushes and beater brush that work together like a dust pan and broom, then the powerful suction gathers all that nasty accumulated dirt into the accumulation bin leaving your floors and carpets extra clean. In addition to the superb vacuuming power, you can even set it to polish the floor by using the included micro fibre cloths that can be attached to the bottom of the vacuum cleaner, and let it quietly roam around your floors giving then that extra shine. *see sell sheet photo below. You must be wondering, how does the robot know where to go? No worries my friend, after you read the user manual and program the cleaning schedule, there is nothing more you need to do. It will actually self-navigate from one end of a room to another with no help from you required (though there is also a remote controller included if you want to have some fun and steer it around). Designed with advanced sensors that detect walls, obstacles and corners, this Smart Robot Vacuum Cleaner knows to rotate around and change direction whenever needed and can be setup to either vacuum for the time-cycle or clean-cycle of your choice. The robot vacuum cleaner also comes with one (IR) infrared virtual wall so you can limit where the robot vacuum cleaner can go. The virtual wall emits a straight infrared beam which will act as a wall, the sensors onboard the robot vacuum cleaner will then detect the IR emitted from the virtual wall unit and will not pass the IR sensor. This allows you to keep it from wandering into the next room. The Smart Robot Vacuum Cleaner is so thoughtfully designed that it even comes with a home base/charging station so that the robot can keep itself fully charged all the time without needing any assistance from you. If you are always busy with work and never seem to have the time to vacuum you floors regularly, then this robot vacuum cleaner is exactly what you need, just program it to clean at a desired time and you never have to worry about doing the work yourself ever again. This new item is in stock in our warehouse right now and available to you at a low factory direct wholesale price. Click "Add to Cart" now and we'll express ship you a sample to see for yourself the amazing robot vacuum cleaner at work in your home. 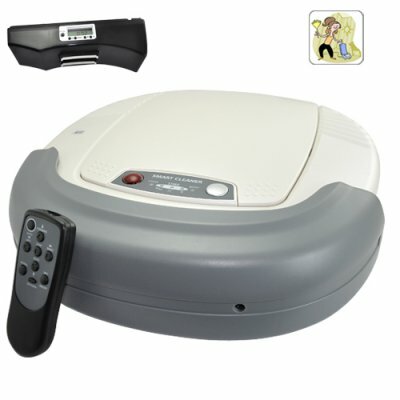 Note this Robot Vacuum cleaner is available with a 220V power adapter. For a 110v version please contact our customer service department for assistance in changing your order. Yes. Long threaded, heavy shag carpet will be difficult for the CVOQ-G185 since it is only raised 22mm from the ground. What is the difference between the CVOQ-G185 and the CVOQ-G186?